Color is always doing something. Sometimes color slams you in your face, sometimes it casts a subliminal spell. So, what's happening in the world of color today? Yesterday? Tomorrow? What are the facts, what are the myths? The Color Matters blog is now at a new location. It's part of the new Color Matters web site. You can use access the archives, use a powerful search function, join a forum, and much more. Go to the new Color Matters Blog! I couldn’t resist twisting Andy Warhol’s quote after seeing the first museum survey exhibition of the work he produced during his final years. It was worth taking the train to Fort Worth during my brief stay in Dallas to see "Andy Warhol: The Last Decade" at the Modern Art Museum. If truth be told, I was more motivated to see the Ando-designed Museum – a cluster of floating pavilions - than the Warhol exhibit. The experience turned out to be a clash of the colorless world of Ando’s concrete and steel structures and the riotous colors of Warhol’s canvases and prints. A powerful juxtaposition of geniuses and color theory! Prior to seeing this exhibit, I had always thought of Warhol (1928–1987) as an artist with a crayola coloring-book approach to color. 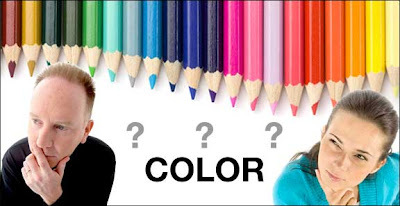 Any color would work as long as it was a raw primary or secondary color. The image – Marilyn Monroe, Mao, or shoes – was the focus. In fact, we recognize his position in art history as the man who transformed soup cans and other icons of pop culture into true art. Now we have this exhibit ... and it exposes his mastery of color and techniques on a scale that you have to see to believe. For example, “Christ 112 Times /Detail of The Last Supper” is an acrylic with silkscreen ink on canvas the size of a bus. 112 small panels of Jesus’ face (from “The Last Supper”) in yellow on black fill the painting. Yellow and black! On a smaller scale, his series of “Shadows” panels (about 4’ x 6’ each) contain a single geometric colored shape that seems to glow from within. They actually rivaled the mystical quality of the Rothko painting in the permanent collection below the Warhol exhibit. By the way, during the last decade of his life, Warhol created more artwork - and on a vastly larger scale - than during any other phase of his 40-year career. This exhibit was a rare opportunity to view 55 works that had never been seen together for the first time. It seems that his color sensitivity was making history in a way that Andy may not have realized. But then again, maybe he did. As it turns out, he was a closet Catholic and - perhaps in the same sense that he was a master of puns - he loved to play with color as much as the object during his last years. Note: The exhibit travels to the Baltimore Museum of Art, October 17, 2010–January 9, 2011. I love interviews with the press because there’s always one challenging question that requires a good answer. Last week, the interviewer asked, “How do you get your color consultation projects?” I replied that half the time, there’s a color disaster underway and someone contacts me. Typically, “the boss” has chosen his or her favorite color for the logo (or the product, packaging, etc.) and a member of the staff senses that there is something terribly wrong with the choice. As for the rest of my color projects, I’m usually involved before a product is rolled out and long before there’s a problem. In recent years, golf carts, computer hardware, medications, garbage cans, and even toilet plungers have been part of the mix. However, just when it seemed that most of my focus was on branding and marketing, an architectural project arrived and I wound up analyzing paint scrapings under a microscope and specifying paint colors for a historical restoration. The only thing that challenges me about this work is that I have to shut down my personal passions for colors and stick to objective criteria. I’ll admit that yellow has always been my favorite color and that other colors drift into my personal kaleidoscope – colors like tomato red and tender shades of teal. But this is my personal agenda and I’d never apply it to the real world of color consultation.